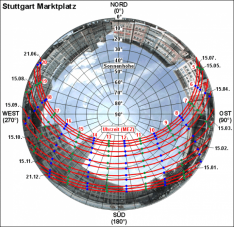 The following links lead to pages where polar diagrams are calculated that allow for determining the position of the sun in terms of altitude and direction and depending on the date and time of some selected dates. The lines of identical time (dotted green and blue lines) refer to Central European Time (CET). 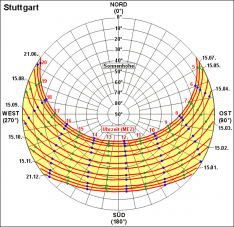 Stuttgart's longitude (9.2 degrees) brings about a time difference of 23 minutes between CET and the average local time. This is why the highest position of the sun is reached at 12:23 CET (13:23 Central European Summer Time (CEST)) and not at 12:00. The course of the sun on 21 June for example (the highest line of the yellow range in diagram 1) shows that the sun rises at about 4:20 am in the Northeast and has a position of about 65 degrees at 12:23. The sun sets at 8:30 pm in the Northwest. 21 June is the longest day of the year with an amount of possible sunshine hours of 16 hours and 10 minutes. The situation is completely different on 21 December (lowest line of the yellow range in diagram 1) where the sun rises as late as 8:14 am in the Southeast and sets after 16:30 pm in the Southwest. This is the shortest day of the year with an amount of possible sunshine hours of only 8 hours and 15 minutes. The highest position of the sun is only about 18 degrees above the horizon on this winter day. The diagram illustrates the position of the sun analogously for the other dates. Shadows caused by buildings or mountains can considerably shorten the amount of theoretically possible sunshine hours within the city.